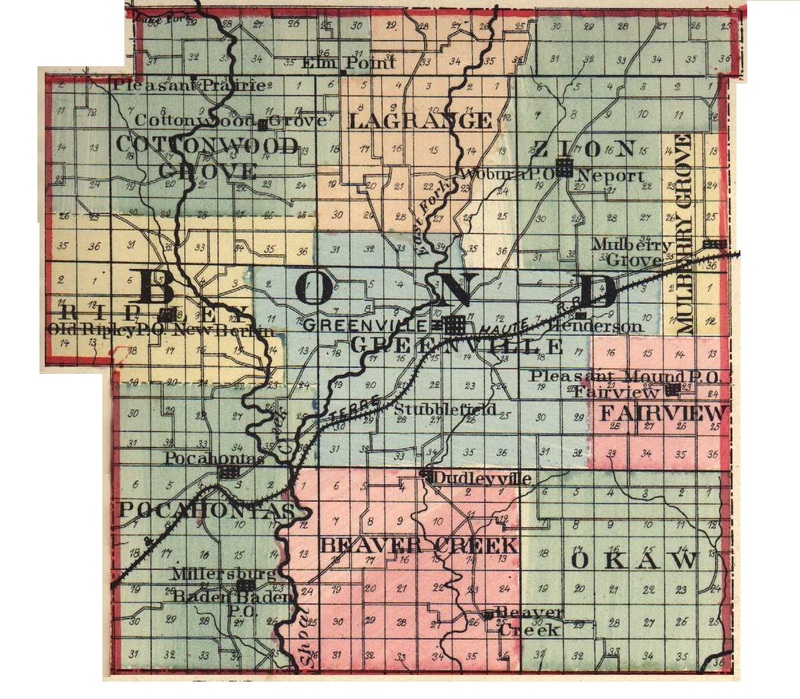 The farming interests of Bond county, Illinois, are in the hands of skilled agriculturists, the majority of whom have made the cultivation of the soil their life work. Born on farms and taught from childhood the work of the farmer, they are ably fitted to carry on their operations and to get the best possible results from their land. One of the representative men of Greenville township, who has followed agricultural pursuits all of his life, is John Cantril, who was born in Bond county, Ilinois, September 29, 1860, a son of David and Rebecca (Greene) Cantril. David Cantril was born in Indiana, and came to Illinois about 1857, settling near Stubblefield, Boone county, where he worked on various farms, traveling all over the southwestern part of the county. In 1858 or 1859 he was married to Miss Rebecca Greene, daughter of Andreas Greene, a Bond county agriculturist, and to this union there were born three children, namely: John, Emma, who died in 1880, and George, who died at the age of two years. After his marriage, David Cantril purchased 100 acres of land and developed a fine farm, but August 16, 1866, he died of cholera, his mother and nephew also passing away of that dread disease within three days. About two years later Mr. Cantril's widow was married to Casper Ulmer, by whom she had three children, and until 1875 lived on the farm by the brick church, but in the year mentioned she and her husband moved to town, where Wallace Ulmer was born, and there she died in 1897. John Cantril received a district school education in the neighborhood of his father's farm, and as a young man went to the West, working in Kansas, Colorado, Wyoming, Iowa and Nebraska, but in 1883 he returned to Bond county and went to farming the old family homestead. On June 6, 1886, he was married to Miss Ella Harris, daughter of James and Elizabeth Harris, farming people of Bond county, and to this union there were born seven children: Lulu, Maude, Harry, Tracy, Forest, Maurice and Arnold. Mr. Cantril remained on his father's farm until 1909, in which year he purchased the tract he is now operating, a farm of 130 acres, and in addition rents 110 acres, devoting the entire amount to general farming and stock raising. A Republican in politics, Mr. Cantril has contented himself with upholding the candidates and principles of his party, and has never sought public preferment for himself. His farm is one of the best to be found in this section of Bond county, the land being well drained, tiled and graded, and produces excellent crops. The fences and buildings are in a good state of repair, and he has a handsome residence situated on Greenville R. F. D. No. 8. He is public spirited and takes a deep interest in anything that effects his community, while personally, he is genial and courteous, and as a result is very popular with his fellow citizens. A splendid business man, an excellent farmer and a sincere friend, Mr. Cantril is a typical representative of the best class of agriculturists in this part of the state. Extracted 10 Nov 2018 by Norma Hass from 1912 History of Southern Illinois, by George W. Smith, volume 3, pages 1706-1707.